Leading and Managing business: What is strategy? I have been studying a lot on strategy of late and recently compiled my thoughts on strategy. My readings, rereadings include, Competitive strategy by Porter, Porter's famous HBR article What is strategy?, Strategy Safari by Mintzberg besides other titles. These readings have shaped up my understanding of the topic and sharing them all below for those who may benefit from it and for those who will enlighten me further with their comments and thoughts. Strategy need not be an explicit exercise. A professional who goes about his job in a chosen way and manner and consistently winning customers with the value he delivers and expanding his business does have a strategy even if he hadn’t thought about it or spent hours analyzing his competitors / industry. Strategy exercise need not be an annual event or for that matter occupy one’s calendar periodically. As the situation demands or as foreseen, strategy exercise should kick start. In a happening industry / environment companies may be forced to re look at their strategy every six months. In a sedate or mature industry, strategy can even be a once in two or three year’s affair. The determinant for the timing of strategy exercise is the ground situation (either real or forecasted) and not the calendar. However nothing stops periodic review of business strategy to confirm assumptions / choices made and that the performance is on desired lines. Strategy should be flexible to accommodate changes as may be necessitated by changing (either real or forecasted) situations. This requires feedback systems that track how well, strategy originally formed is implemented and serves its purpose. Strategy may be formally formed at the top but the inputs for the same should come from all interested sources from within and from all corners of a business / company. Feedback systems play a huge role in strategy formation. Strategy = Thinking + action. Strategy is “an elaborate and systematic plan of action” is how the dictionary defines it. Strategy sans action is not strategy but just a theorization of how an organization should move forward. A business needs to formulate / reformulate strategy under following situations. I have read with great attention this article and, as a strategist for business in Spain, I was particularly pleased with the concise and clear way you have structured your ideas. Reminding all of us that strategy is a choice is hugely important. We must make choices every day, beginning with choosing, very thoroughly and consciously, how we define our product or service and who our public is. In my experience, this usually represents one of the first fissures for a business' strategic plan. A core element often not clearly understood or defined. The next points about explicit exercise and annual event touch on another key idea that I consider to be part of a fundamental philosophy: the continuous process of strategic thinking. If this kind of thinking becomes habit, if it becomes part of a team's daily practice, that is the surest route to success and meeting goals. Another important point you communicate is that of flexibility. Again, strategists (which we can all be, there is no need for a formal title if leaders and teams learn how to embrace strategic thinking in their daily practice) must be agile. That is the name of the game. The etymology of the word strategy comes in part from a warrior, which I turn into a metaphor of course. Drawing from Oriental philosophy/spirituality, the warrior must always be on watch, eyes open, senses alert, for movement by the surrounding forces. It is important to keep our enemy close (again, a metaphor), know them intimately, listen to their language and watch their choreography. This agility of the senses and decision-making can be summed up in your idea of flexibility. Without that, we are rigid and quickly become stagnant, the antitheses of strategic activity, from my perspective. 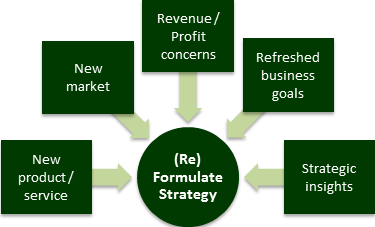 Your last graph on formulate/reformulat illustrates in clear business lexicon the constant movement, question-asking and innovation that, for me, is inherent in sound strategic practice. I think your article is a very useful snapshot definition and refresher for any business, large or small. Thank you for putting it clearly for us. Excellent thought. Can there be a better explanation for why strategy should be a continuous process and should not be a rigid schedule on the calender. How well you have put it? Thanks for such an articulated expression. For converting your business idea in reality you need proper business consultation. We at PlanThyBusiness are always here to help you in business plan consulting and also can suggest you some potential financing services for startup.